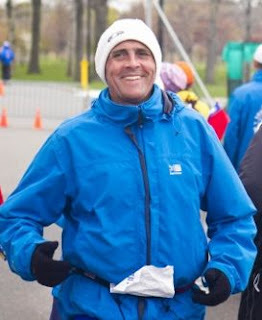 Karteek Alan Clarke is a Scottish member of the Edinburgh Sri Chinmoy Athletic Club and an accomplished runner, having completed numerous marathons and ultramarathon runs and walks. But he has also taken his marathon mindset to the water: He has completed 11 English Channel solo crossings, pioneered three first unassisted cold Scottish swims, and completed a number of other marathon swims as a vegetarian member of the Sri Chinmoy Marathon Team. He will soon come out with a highly anticipated book that includes special emphasis on the issues such as the deeper meaning of marathon events, motivation for marathons and how it prepares one for future greater challenges, how to derive as much joy and happiness from the training as the event, turning an injury into a physical and mental stepping stone, getting stronger during and as a result of weather delays. 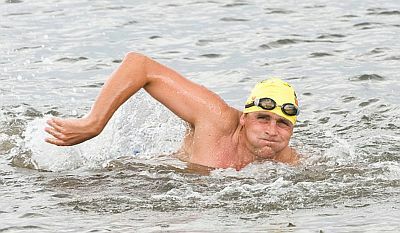 On dryland, Clarke has completed over 20 running marathons, a number of 50-mile runs, a 24-hour race, and three multi-day races over a period of 6 days and twice over 10 days.